These are, fundamentally, the same concept. They have the same “essence” i.e. the right to life, and all that right implies. To speak of a trade-off or balance between securitas and libertas is to make an error. More security does not mean less freedom. Rather, the logic of modernity implies that more security must mean, or bring about, more freedom. Precisely: because this security satisfies and upholds my right to life. So, security – as the desire to have more than one needs – becomes the desire for life itself. Therefore, we have an asymptotic (?) 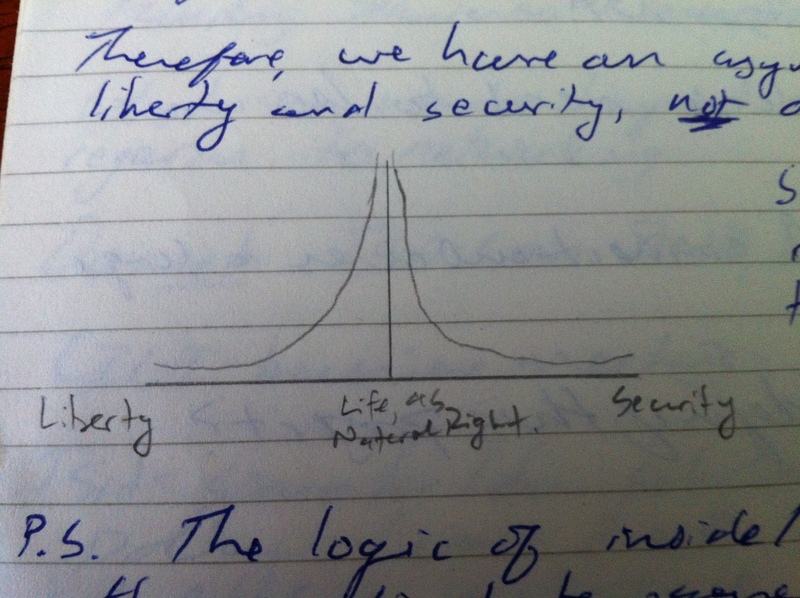 relationship between liberty and security, not a trade-off. Sovereignty is the institution that upholds rights. Security is the activity that does the upholding. They are essentially the same. p.s. The Logic of inside/outside is made possible by the noetic heterogeneity of the best/ideal/just regime. p.p.s. “Security” is a vision of the good society, therefore posing the question of the good as such. cf. Thoughts on Machiavelli, p.268. Well then. My past self has given my present self something to think about.